Caring people make the difference at Heritage Park. You can feel it the minute you walk into our community and meet our team members. They are here to help you and your family find the answers you have been looking for, all while keeping your peace of mind. Heritage Park offers a complete range of living and senior healthcare solutions to provide our residents live life at their highest quality. When you’re looking for independent living or assisted living options in Fort Wayne, we can provide the personalized care you need in a comfortable, compassionate environment. We are conveniently located in Fort Wayne on Hobson Road, just south of East State Boulevard and northwest of New Haven, IN. With easy access to I-69, Heritage Park is close to emergency health care including Parkview Memorial Hospital and Lutheran Hospital of Indiana, a freestanding ER and VA hospital. We are also close to a variety shopping centers and restaurants. At Heritage Park Assisted Living, we understand pets are part of your family, so we are proud to be a pet friendly community. You will feel right at home! Heritage Park uses gardening as a fun and therapeutic tool for residents. Heritage Park to raise money for the Alzheimer’s Association. Fort Wayne Journal Gazette reported on Heritage Park centenarian Dora Ross turning 105! News Sentinel shared the heartwarming tale of an elderly senior who decided to become a volunteer at Heritage Park after receiving therapy. The Journal Gazette featured volunteer Denny Parker after receiving Heritage Park’s Compassion Award. The Indiana Healthcare Association Names Heritage Park as the 2016 Assisted Living Facility of the Year! American Senior Communities and Heritage Park would like to acknowledge Dennis Parker as ASC’s Volunteer of the Year 2015 Finalist! Want to learn more about Heritage Park? 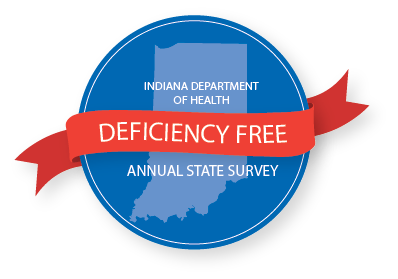 Ask us about our deficiency-free annual survey.